The creators of Sherlock have confirmed the hit BBC One drama will be back for a special in 2015, followed by a fourth series of three episodes. Starring Benedict Cumberbatch and Martin Freeman, the special will start filming in January with the series following later in 2015. The award-winning show is co-created by Steven Moffat and Mark Gatiss. Gatiss promised the new series would take Sherlock Holmes and John Watson "into deeper and darker water". The announcement follows comments from Freeman, who plays Sherlock's sidekick, earlier this week. He appeared to let slip in an interview the show would return for a one-off special. He told The Telegraph: "I'm speaking off-message here; if this was New Labour I'd get fired - I think that might be for next Christmas. A Christmas special. That's what I understand." Freeman also confirmed his real-life partner Amanda Abbington would return to her role, as Watson's new wife Mary, for the special. 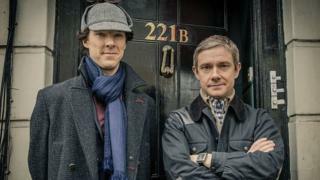 The last series kicked off with Sherlock returning from the dead, however the BBC said series four would be "the most shocking and surprising series of Sherlock yet". "Of course, it's far too early to say what's coming, but we're reasonably confident that the very next thing to happen to Sherlock and John, is the very last thing you'd expect," said Moffat, who writes and executive produces the show with Gatiss, inspired by the works of Sir Arthur Conan Doyle. Gatiss said the team were "terrifically excited" about returning, adding: "At last! It's always special to return to Sherlock but this time it's even more special as we're doing...a special!" The popularity of the show's stars and creators has made it difficult for them to commit to filming more episodes until now. BBC One controller Charlotte Moore said it was "no mean feat pinning down some of this country's most brilliant and in demand actors and writers" for shooting. Cumberbatch will soon star as World War II codebreaker Alan Turing in the film The Imitation Game, while Freeman recently appeared on our screens as the star of US TV drama Fargo. "It's taken a little while to get the dates sorted as none of the boys are exactly sitting back twiddling their thumbs," said Sue Vertue from Hartswood Films, the company which makes Sherlock for BBC One. "But there was unanimous goodwill to make this work so we're thrilled that 221b is going to be inhabited again." Sherlock Holmes: Can a fictional man be a London icon?